In the great Metal genre called Glam Metal, as in all the others, you have an ample set of musical subgenres. That’s the reason you can see two opposite bands under the same label (think that MOTLEY CRUE and BON JOVI are called Glam Metal bands by many). In the aggressive trend of Glam Metal there’s Sleazy Rock, where some nasty Punk Rock influences can be detected. So we can classify the work from Finnish quartet LIVERBOX as Sleasy Rock, because it’s what “Rock N’ Roll Salvation” is about. The album’s title is an irony, a thing that can be seen on Sleasy Rock bands, along with some lyrics that can make all political correct to run away cry for their mammas. These four bastards are unleashing a melodic, nasty and catchy form of Glam Metal, filled with excellent and charming melodies, very good choruses, but with those nasty and ferocious elements that on the 80’s were reasons for fueling PMRC speeches and complaints. Yes, it’s really very good. The album’s production had as it reason to build something that could sound nasty and clean at the same time. It reached a very good level, evading to sound outdated, but with an excellent organic feeling, like they just turned up the amps and played the songs. It doesn’t seem as “Rock N’ Roll Salvation” had too many digital editions. When the album starts to play, step out of their way, because it’s like a locomotive running down a hill at full speed. We can say that the crude energy of “Falling Apart”, the excellent groove that fills the guitar riffs on “Blackbird ‘72”, the savage and hooking dirty approach of “Now or Never”, the accessible elements of “Sick Love” (fine chorus and great backing vocals), that rawness that is usual to Sleazy Rock bands that can be heard on “Saviour of Rock N’ Roll”, and the wild tempos of “Sweet Sister of Salvation” are songs that form the spine of their acts of purest defiance. If you’re a crying SJW looking for trouble, don’t step in their way. 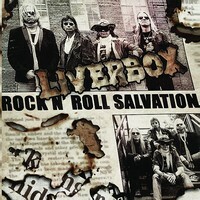 But if you’re a Metalhead with guts, listen to LIVERBOX without fear.